Vasyl Cherepanyn. Photo: Olga Ivaschenko.Kyiv’s Visual Culture Research Center recently hosted The Kyiv International, a biennial comprised of lectures by leading critics and cultural figures. 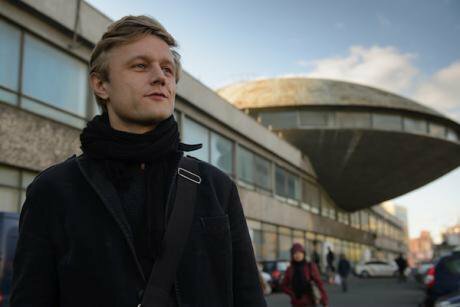 I spoke to Vasyl Cherepanyn, one of the co-organisers of the Biennale, about the programme, Ukrainian modernism and the emergence of new walls in Europe – metaphorical and all too real. This isn't the first Kyiv Biennale organised by the Visual Culture Research Centre (VCRC). How did your work as organiser of the Biennale begin? We took up this idea three years ago, when it had already been initiated by someone else, but not us. 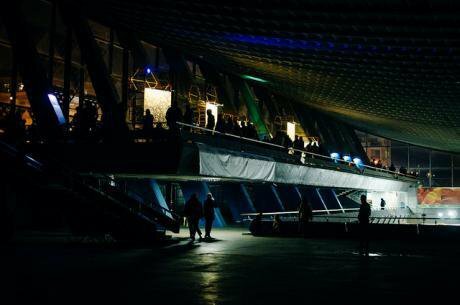 The first Kyiv Kyiv Biennial – Arsenale 2012 – was held as part of the European Football Championship. As an institution, we participated in it with our own parallel programme. 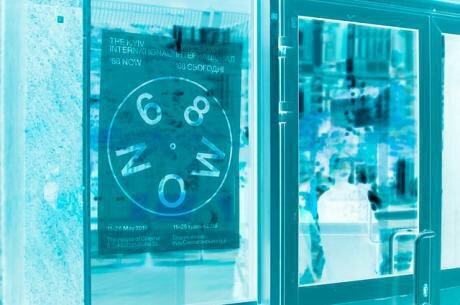 The next Kyiv Biennial was at first postponed because of Maidan, and then later it was cancelled altogether because of the decision of the then-Directorate of the Mystetskyi Arsenal. We had previously worked with Hedwig Saxsenhuber and Georg Schöllhammer, the former curators, so we decided to take over the organisation of the “School of Kyiv” in 2015, completely changing its logic and structure. At that time, our goal was to visualise, via artistic and educational means, what was absent in Ukraine’s political sphere after Maidan. We wanted to work through the experience of revolution, and this was where the “School of Kyiv” fulfilled its role. We used various discussion platforms: institutions inherited from the Soviet times, new galleries, state cultural institutions, platforms of various initiatives and organisations that work with internally displaced persons, and also establishments that have never previously been associated with the cultural field – for example, the House of Clothing on Lviv Square, Kyiv. This way we managed to create the conditions for a discourse on Kyiv as a new post-revolutionary spot on the European map, and, surely enough, Kyiv did begin to speak. Has the first part of the “Kyiv International” been easy, given the experience of organising the last event? Quite the contrary. Today we are in far worse, politically counter-revolutionary conditions. After the attack on David Chichkan’s exhibition at VCRC in winter last year, we had to decide: should we do the biennial at all, especially with this year’s internationalist theme?Here it is necessary to bear in mind the general situation in Ukraine, when any association with the left side of the political spectrum is simply off limits. For the first part of the Kyiv Biennial, in 2017 what was important was that it was the “Kyiv International”. We don’t have a fetishistic commitment to using the biennial format every two years. We are using the biennial framework in order to raise a certain range of problems, and we are attracting international institutional partners in order to create an intersection between artistic, intellectual and political grassroots movements. And, in light of that, we still remain an autonomous institution. All events that took place during last year’s Biennale were organised by the VCRC; we did not invite any external curators. You mentioned the word “international”, a notion that is already discredited in Ukraine. How did you introduce this notion into the framework of the Biennial, and how one is supposed to work with it in the first place? “Internationalism” isn’t a discredited word, but rather one that has been pushed out and forgotten. The thing that it signifies is what we are missing the most right now. On the other hand, are there any words that aren’t discredited? “Democracy” is just as discredited a word, it is also a notion that has been used to cover many wars. Poster of the Biennial “Kyiv International”. Source: Facebook.Take an example from religion, where most notions have been discredited and used to justify mass murders. The field of politics is currently dominated by a combination of transnational global capital and far-right localism. The idea of internationalism has always lead to progressive shifts and emancipatory consequences. Indeed, the very idea of a unified Europe at its core is based on free movement of people, and not only commodities. This idea is aimed at increasing liberty, intensifying communicatory, educational, cultural and political possibilities. Only standing up for yourself, the principle of extreme protectionism – this is a dead end for society. Does the “International” provide a universal language for art as well? Here we’re dealing with the question of creating a universal political language by means of education and art. Today’s global agenda, of which Ukraine is a part, is based on the following: outsourcing of wars – i.e., carrying them out in the peripheries – raising new walls, and the necropolitics of memory. Meanwhile, the notion of internationalism primarily implies the necessity of international solidarity. The idea of internationalism always was and still is revolutionary, and democratic internationalism is also something that is sorely missing in our contemporary status quo. Here we are referring to the revolutionary movements and social protests that are both temporally remote, and contemporary – from Occupy Wall Street and indignados, to the Arab Spring uprisings and Ukraine’s Maidan. The “Kyiv International” is both a proposal and an attempt to develop a common political language – the “common” European space lacks a common vocabulary. Not least, this results in a tendency towards shrinking or even partial disintegration of this space. We are in the process of developing both the vocabulary and the political and intellectual movement. We don’t know what this vocabulary will look like eventually, and what path its development will take, which is why it is the sign of a real emancipatory politics: we have no prescribed recipes and no guaranteed results, we are merely trying things out. Are you talking about physical walls? Certainly. Today the Schengen system itself is no longer working: several Balkan and East European countries are building new physical walls and surrounding themselves with barbed wire, while their right-wing radical parties are taking the positions of power. This is a very dangerous situation, and today we have to ask ourselves: how can we resist this tendency, and survive these new dark ages? Photo: Olga Ivaschenko.Here the “Kyiv International” hits the bull’s eye – by their very definition, reactionary forces cannot appropriate the idea of internationalism, which always constitutes a political alternative in relation to them. If the “International” is a tool, then what would be the unifying factor? Here we are talking about a certain range of actions in our current social reality – not in some phantom future, nor in a constructed history, but in our present time. The most pressing need today – and not only for Ukraine, but for the whole of Europe, as well as the whole world – is stopping war. After all, the Second World War was what gave birth to Europe itself. War is a cancer of politics, a poison that is now unleashed against revolutions. It is no accident that all the countries that were recently shaken up by revolutionary uprisings and civic resistances are now involved in wars. Generally all revolutions – including the one in Ukraine – represented the politics of hope. They were aiming at the future, while wars and walls are expelling the very idea of the future altogether. In this context, the idea of “Kyiv International” is aimed at remembering this future. To return to the programme, tell us how the “Dish” (the nickname for Kyiv's Institute of Scientific, Technical and Economic Information) at Kyiv’s Lybidska metro station became the main location for the Biennale? 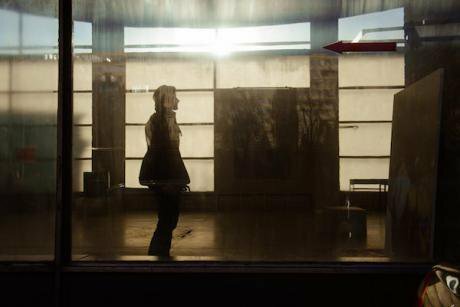 In a way, all the main locations we chose existed outside the field of art. As for the “Dish” itself, for a long time one of the protestant sects has been using it as a place for prayer meetings. We found it important both conceptually and politically to direct our attention to the phenomenon of Kyiv modernism. Historically, modernism has always been inherently directed towards utopia, and internationalism has always been at the basis of the former. Modernism is unique because it is both universal and local: after being born in Europe, it spread during the 20th century throughout the whole world, which is why today we have Brazilian, French, Senegalese, and other modernisms. Modernism is global, but it always retains its local specificity. Vasyl Cherepanyn at the "Dish", the Ukrainian Institute of Scientific, Technical and Economic Information, Kyiv. Photo: Olga Ivaschenko.Being one of the key components of the city, Kyiv modernism – together with Baroque – is currently exposed to vulgar and barbaric renovations. Both the “Dish” and Zhytny Market [another Biennial location] are now threatened by renovation. Because of the primitivising effect of Ukraine’s decommunisation policy, and low level of artistic consciousness in general, the debates on the value of this architectural heritage are starting only now. By the way, according to its architect Florian Yuryev, the “Dish” has the best acoustics for a public space in Ukraine. It was built in the spirit of avant-garde and was intended as a theatre of light-music, which has its historical origins in Kandinsky’s idea of artistic synesthesia – a synthesis of sound, light, and image. Zhytny market is also a unique construction that draws directly from the so-called international style. For the first time in the context of the Biennale, this market was used to host an art show – the exhibition “Bazaar” was dedicated, among other things, to the architectural tradition of the indoor markets. Opening of the exhibition “Bazaar” in the Zhityny market, October 2017. Photo: Alexander Kovalenko, Daria Nikolenko / Visual Culture Center. All rights reserved.Interestingly enough, on the level of an artistic concept, Zhityny market was constructed as a reflection on the theme of the “trade route from the Varangians to the Greeks”. This imagery is mainly based on the fact that Kyiv was founded on the crossroads of commercial, and, consequently, communicative and cultural routes, which fits the historical location of Zhytnyi market. 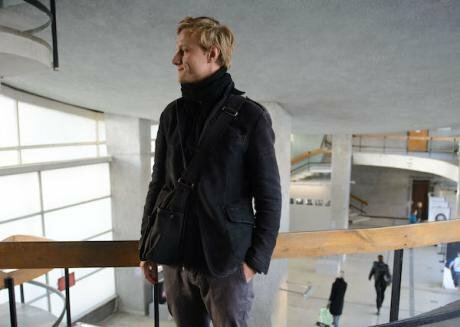 The first part of Kyiv Biennial featured a film programme. Was it an attempt to emphasise the importance of Soviet Ukrainian cinema? A call back to the Ukrainian visual and literary culture of the period of 1910s-1920s is necessary relief in the contemporary Ukrainian context. This period gives us a chance to learn what it means to be modern because, as a specific quality, “contemporaneity”is far from being identical to “the present”. Contemporary Ukrainian culture is far less contemporary than it was a hundred years ago. Ukraine’s tradition of the artistic and literary avant-garde has been forced out of its once dominant position and remains in the margins to this day. European cinema is unthinkable without Dziga Vertov and Olexander Dovzhenko; Olexander Arkhipenko, Kazimir Malevich, and Olexandra Ekster were at the forefront of artistic innovations of their times; while Valerian Pidmohylny and Mykola Khvylevoy brought contemporary urbanism to Ukrainian literature. This cultural avant-garde remains unsurpassed till this day. How blind can Ukraine’s decommunisation policy be, cleansing Ukrainian culture of everything connected to the Soviet period, depriving it of its strongest artistic periods! Ukrainian modernism is among one of the most productive, progressive and contemporary periods in the whole history of Ukrainian culture. In this sense, the film programme of the “Kyiv International”, curated by Stanyslav Menzelevsky, a researcher at the Dovzhenko Centre, included films by Dovzhenko, Kavaleridze, Dziga Vertov and Kaufman. This programme didn’t only trace an outline of that time, a selection of things that defined Ukraine in the 1920s. It was also a retro-futurist reflection on contemporary Ukraine.